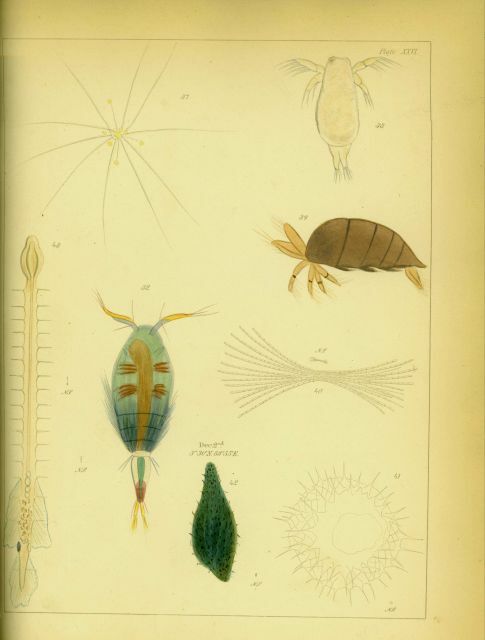 Drawing of zooplankton observed by Ellen Toynbee on board the British East Indiaman GLORIANA in the Indian Ocean in 1857. This is one of the first instances of a woman engaging in any aspect of marine biology. In: Maury, M. F., 1858. “...Wind and Current Charts”. Vol. I, Eighth Edition, New and Enlarged. Plate XXVI. PP. 219-220 for Toynbee letter.